A very, very early build of Ice Cream Sandwich with Samsung’s TouchWiz UI has been leaked today. While it is too unstable for daily use, it does give us a potential glimpse at what Android 4.0.x Ice Cream Sandwich will look like when it releases in a few months for the Samsung Galaxy S II. Details after the jump! The news comes from SamMobile – a blog dedicated to covering all things Samsung – in the form of a post in which they talk about the leaked build of Android 4.0.1 (Build: KP1) Ice Cream Sandwich for International Version of the Samsung Galaxy S II. The leak has, apparently, been sourced from Sam Mobile’s “insider” at Samsung. This is, of course, a very early leaked build. It does offer us a “glimpse” at the what the final version may look like (heavy emphasis on may), but since we have quite a few months before the update is actually released, so this shouldn’t be taken as final. Samsung has plenty of time to make changes to give their custom TouchWiz UI an ICS-like look and feel. Since it is an early build and is susceptible to random reboots and force closes, it is highly recommended that you stay away from this. It is not at all stable enough to use on a daily, routine basis. Last week our “insider” presented us with XXKP1. The Android version of this ROM is Android 4.0.1. The build date is 7 december 2011. As you may know of us we often get these leaks prior to release. After we did some checks on it we can confirm that we’re dealing with a “CUSTOM” Samsung build. Once again, before you get started, please please note that this is very unstable. Besides this, your warranty will be voided forever (because it, apparently, doesn’t let you reset the counter which technicians use to determine if your phone can is covered by warranty). Note: This only works on International Version of the Samsung Galaxy S II. 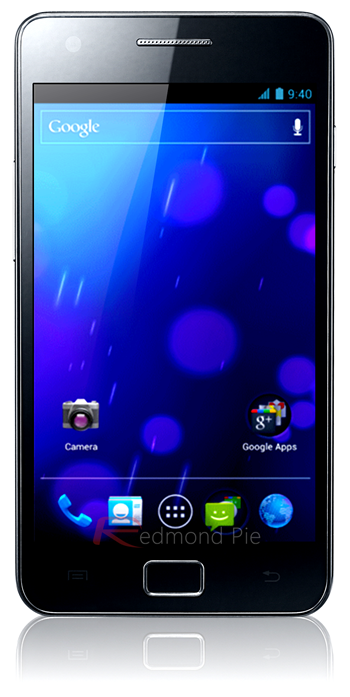 It has not been tested on Epic 4G Touch, Skyrocket or any other of the Galaxy S II variants on US carriers. Step 2: Unzip the .rar file you downloaded from HotFile in Step 1. There will be four files inside. Step 3: Install USB Drivers. Shut down Samsung’ Kies PC software. Launch ODIN (in that exact order). Step 4: Turn off your Samsung Galaxy S II. Step 5: Press Volume Down + Home + Power/Lock while booting up to enter Download Mode. Step 6: Connect your device via USB and you should see it detected by ODIN. Step 7: Click on BOOTLOADER and add I9100_APBOOT_I9100XXKP1_CL16459_REV02_eng_mid_ship.tar.md5. Step 9: After that, click the Start button. Step 10: Wait for your phone to restart and then unplug it from your computer. If you followed the steps correctly, Android 4.0.1 Ice Cream Sandwich will be installed on your Samsung Galaxy S II. If you face any issues or have queries, check out this thread over on XDA-Developers.